Maybe you’ve swapped one addiction for another. From booze to cupcakes and endless slices of pizza. You might finally be sober (and high five for that!) but food still holds a firm grip around your jugular and the daily mental food hell hole you’re in is not how you envisioned your life to be as a sober superwoman. Not being able to say no to food frustrates you. How hard can it be? You’ve managed to stop drinking, why does it still feel like food has power over you? Because it has. Kinda. Ok, let’s back up a bit and let me explain. Food can feel like an obsession. An addiction of sorts. You want to break up with food but you can’t, no matter how hard you try. But here’s the thing, there’s no such thing as food addiction. I know it can feel as if sugar equals crack and once you have a tiny bit of chocolate there’s no stopping you and you can’t stop craving sweets no matter how much willpower you excerpt. Because it was never about an addictive substance. It was never about detoxing from the grips of sugar in your system. It was never about you lacking willpower either. It was always about a habit. A habit gone wrong. A habit created in your brain, by the survival part of the brain which now will do anything (yes, even if it’s killing you) to keep the habit running in the background because it believes it’s essential for your survival. Your poor primitive, two-million-year-old brain is just doing its job. But now’s the time to change its job description. Welcome to your lower brain. To explain how to rewire that old brain of yours we need to understand one basic fact. Brains can change. Yes, even yours. Brains are plastic and if you understand the mechanics behind neuroplasticity you’re all set for lasting change. Neuroplasticity, or the brain's ability to change, is your ticket to freedom from the food obsession. Once you crack the code to how our mind works, you’re free. If you want to end the struggle with food once and for all, keep reading. For over 25 years I searched for a permanent solution to end my struggle. How could a woman who was super successful in life and business not be able to get a grip around food? I had tried every single diet on the planet. I had tried therapy. I had tried managing my thoughts and hypnosis of all sorts. I had tried pills and magic potions. But nothing would stop me from bingeing on all the ice cream. Or cookies. Or bread. Or whatever I could find in a moment of frenzy. For a high achiever who takes pride in smashing every goal I’d set my mind to this felt utterly devastating. I was depressed and filled with anxiety. Life was passing by and I was just a passenger watching by the sideline. But then I stumbled upon something that would forever change my life. Mindfulness is so well documented by now and backed by science that I’m not gonna go all research-nerd on you but let me say this; Mindfulness rewires the brain. For lasting change. Mindfulness, the right way, shows you how to retrain your old reptilian lower brain to stop the crazy urges to eat all the donuts and shows you how to reclaim power over food. Mindfulness is the link between food hell and a life with complete freedom and peace around food. Mindfulness strengthens your mind so that you become unconquerable in the storm of a food craving. And more importantly, mindfulness shows us that we had the power all along. We were just looking in the wrong direction. So now you may be wondering, what is Mindfulness? Glad you asked. Mindfulness is basically the art of paying attention. The art of choosing what you want to pay attention to. It’s the art of non-reaction, meaning, having the ability to not reacting to a food thought, urge or craving. You might be thinking “too much fluff!” and dismiss it as too simple. Hear me out here because I can’t stress this enough. Mindfulness is your ticket to freedom. I can’t stress this enough. Mindfulness is what will essentially break the horrible habit of eating out of control. No food plan or diet will ever do that. A new shiny diet can’t jump into your brain and change the neural wiring. Only you can, through the power of mindful awareness. Because it all comes down to awareness. Being fully aware of how your mind works. Being fully aware of where thoughts come from and how they are constantly creating your experience. Looking towards the world within will change your world without. Let me invite you to a radical new way of breaking any habit. Let me invite you to lasting freedom. Become a detective and start being curious about the food chatter. What thoughts are recurring in your mind? When you feel the urge to overeat or binge, what are you thinking? Become still inside your mind. Like a Zen monk find a place of non-reaction. This can feel impossible in the beginning but it’s just a matter of practicing. Practice being still in the face of a craving. With the power of your intention redirect your attention to something else. Take the focus off of the food thoughts and instead choose to redirect your attention elsewhere. Simple. But not always easy. But this is the foundation to rewire your brain. And once you get a hang of it, you’ll never look back. This article was first written for Soberistas. 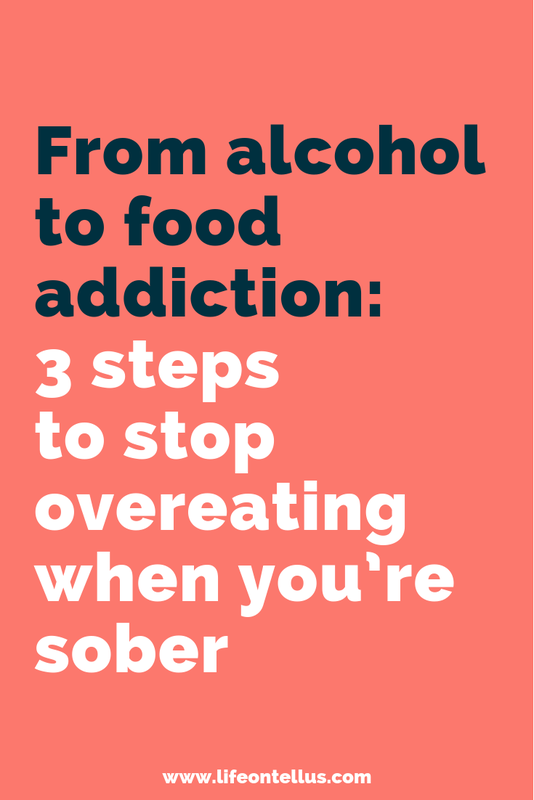 If you struggle with overdrinking, Soberistas is the perfect place to be!